I wanted to share a few pictures with you that show why I'm writing to thank you. 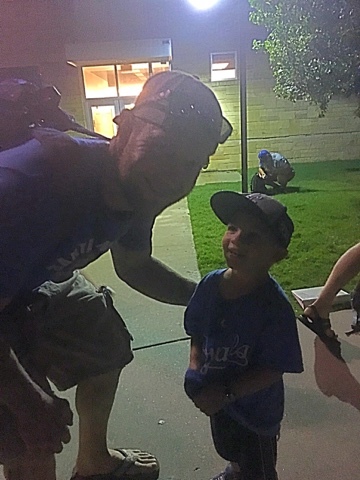 You see my three year old, Kaden, knows more about baseball and the Royals than many adults I know. He loves as he would put it "all of the Royals" but without a doubt, without any hesitation when asked who is his favorite player is his answer is always one player; you. I'm not kidding when I say Gordo was one of his first words. In fact anything baseball for the longest time was called Gordo. I'm not exactly sure why he took such a liking to you. I joke it's because his first ever game at the K and you hit a grand slam when he was not even a year old. For what ever reason he adores you. He even has a little Gordo plush doll that he likes to take everywhere. This past year has been the toughest year for our family. Our second son, Kaleb, was born 12 weeks early at 2lb 2oz. We also learned of his diagnosis of Down syndrome two days after his birth. He spent 99 days in the NICU and then came home with oxygen and monitors. Since coming home with the NICU he has also had a heart cath and open heart surgery. As parents we have felt bad for the toll the past year has taken on Kaden. The time that has been spent in hospitals has taken away from Kaden. To talk to him you wouldn't know it, and he is just happy his little brother he loves so much is now much better. He is already very protective of him. So I admit we have attempted to cater to him a little bit more this summer in attempts to make it special and thank him for being such a trooper. When we made our annual trip to Kansas City he already knew he wouldn't see you play. He was devastated the day I had to tell him you had gone on the DL. 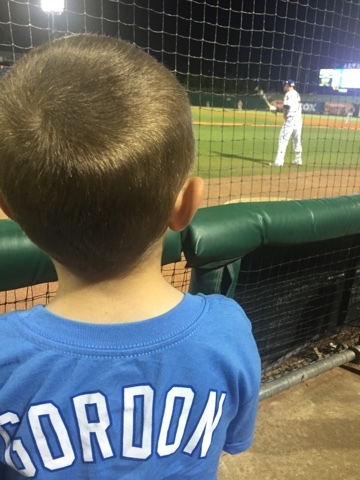 So when we learned you would be going to the Naturals for a few games we decided to drive the two and a half hours to let him watch you play. You wouldn't believe how excited he was! He held his little fists over his head smiling ear to ear as you rounded the bases after your homerun (which he watched up close from behind the on deck circle). He watched your every move while you were in the dugout or when you were on deck. His night was made in the 9th when you said "hey buddy" when he said hi Gordo. 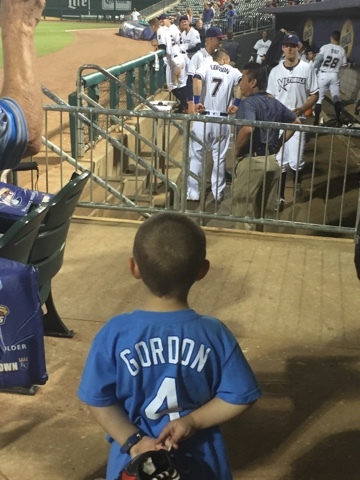 We even waited after hoping we could get you to sign his first ever Gordon jersey he owned. While I had left to put our youngest in the car TJ said he was so proud of him as he watched him hand you his jersey and say please. Then as he remembered to say thank you after. (We have been working on being respectful and saying please and thank you). TJ then told me you even took a picture with him. When I looked at the picture on the way home tears came to my eyes, to see the look of admiration on my son's face standing there looking up at you. You have no idea how thankful I am to you for taking the time for a young fan. As a parent of little boys yourself I'm sure you understand the feelings we experience as we watch our little boys grow and become men. Thank you for being such a great role model for my son. Ha, even though now I'm having to explain to him the next time we go to Kansas City to watch the Royals he won't personally see you. To which he says, "Why? Gordo likes me." Thank you. I will always treasure that picture. Not because it's with a World Series champion, all-star, and gold glover (even though that's pretty amazing). But because of the look on my son's face and all that it represents. That picture represents Kaden's last couple of years of admiring you. The kid's third birthday party was a Royals themed or as he called it a Gordo party. It represents all of his crashes into every wall/fence/couch/etc "catching the ball" or putting his glove on his head trying to be like you. It represents his love of the game and the love a little boy has for his hero. That is simply beautiful in every aspect. Thank you Gordo. Go royals! What a fantastic letter! As a mother, I am so touched by your story and as a huge Royals fan I am so proud of our team. Way to go Gordo!! flags may fly forever but men (and women) with hearts of gold are priceless. thanks gordo, mr. moore and royals for putting character first. that's why you're first in KC's hearts. As I finished reading this, I had to choke back tears. Thank you for sharing. Good luck to you and your family. on my desk. You are my favorite Royal not just because of your ability but because of your love of family, fans and the team. Thanks for the man you are.